The WorkForce Pro ET-8700, designed specifically for the small-to-medium business market, allows users to speed through projects with 24 ISO ppm (black/color)† print speeds, plus fast scan speeds of up to 24 ppm3. Powered by PrecisionCore, it delivers laser-quality black text and color graphics. Unlike previous models which included side compartments to hold the ink packs, the ET-8700 features a space-saving, easy-to-load system at its base, making the ET-8700 40 percent smaller than the previous generation4. "With the new low-cost replacement ink packs integrated along the base of the ET-8700 printer, we've taken Epson's traditional EcoTank design, and optimized it for high productivity," said Nils Madden, marketing director, Consumer Marketing, Epson America. "We've made it easier for business owners to enjoy the hassle-free two years of ink in the box1with this new, easy-to-use design and ultra-fast print speeds, giving them more time to focus on what's really important – managing their businesses." 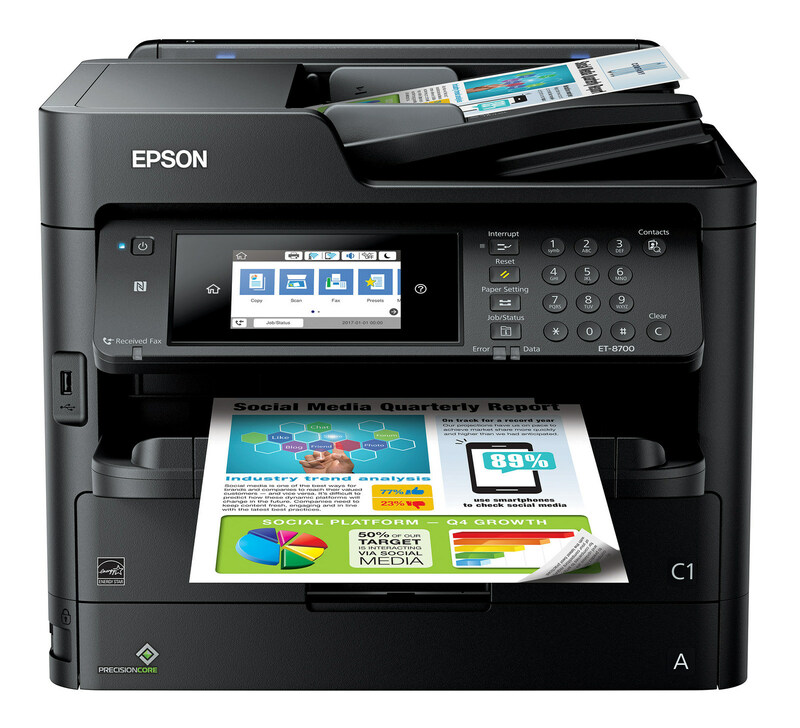 The WorkForce Pro ET-8700 EcoTank ($999.99 MSRP) will be available April 2018 through major computer, office and electronic retailers, and on the Epson store (www.epsonstore.com). The ET-8700 features a two-year limited warranty with registration9. For more information and availability, please visit epson.com/ecotank. Epson's EcoTank line of all-in-one printers feature cartridge-free printing and revolutionary ink replacement technology. They offer an unbeatable combination of value10 and convenience, with super-high-capacity, easy-to-fill ink tanks. These all-in-one printers come with enough ink in the box to print for up to two years10, so you can print thousands of pages11before replacing ink. To learn more, visit www.epson.com/ecotank.